This dovetail saw guide and right angle saw guide have been developed to allow amateur woodworkers to achieve professional results. This system also allows the seasoned expert to produce dovetail and right angle joints more quickly and with less effort. 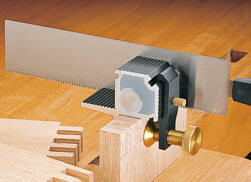 This dovetail guide was developed to allow amateur woodworkers to achieve professional results. This system also allows the seasoned expert to produce dovetail joints more quickly and with less effort. The guide comes with a sliding clamp that is designed to fit either side of the guide to allow cutting of both pins and tails. The guide has embedded rare-earth magnets to ensure that the saw remains in contact with the guide faces, and the magnets are covered with plastic pads to allow the saw to slide smoothly. 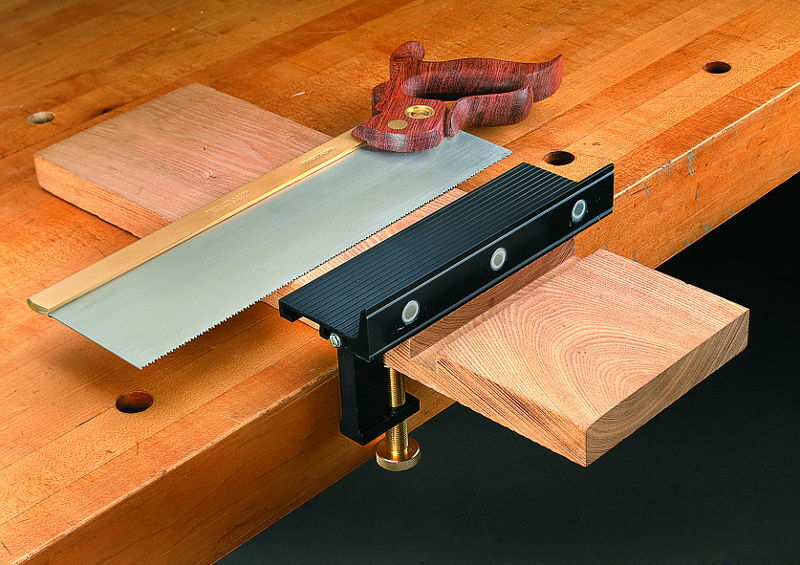 Note: Typical Japanese dovetail cutting saws with back are not suitable for this guide. Any back on the blade will interfere with this guide. Use a backless japanese saw - Ryoba or Kataba - or an English type Dovetail saw or Tenon saw, which do not interfere with the guide due to their wide blade. The guide itself overtops the workpiece with 40 mm. 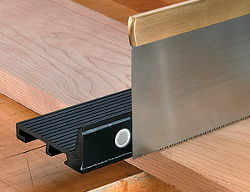 If your backed saw allows a cutting depth of 60 mm, the max. width of the boards can be 20 mm. Please consider this when choosing a saw. Beyond that the max. width of a board can be 25 mm/1 inch. The teeth of the saw should be set no more than 0.1 mm/0.005 inch, as the plastic pad prouds only 0.1/mm/0.005 of the guide face. In other words, if your blade is 1 mm thick, the kerv your saw makes should not be more than 1.2 mm. The best saws for this dovetail guide are our Japanese Kataba saws ripcut or - if you request extremly clean cuts - the Kataba ripcut made by Hishika. The guide comes with a 16 pages instruction leaflet (PDF). This new 14° guide is designed to approximate a 1:4 ratio, for those who prefer this angle when working in thinner stock, as it not only provides stronger material interlock than traditional ratio angles but produces a slightly exaggerated dovetail joint that many find attractive. Note: Please have a look to the corresponding Veritas dovetail saddle markers 1 : 6, 1 : 8, and 1 : 4! Marking with dovetail saddle marker, sawing with the help of a dovetail saw guide! 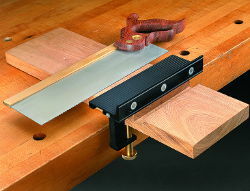 This is the 90° version of the Veritas dovetail saw guide. It was developed for making finger joints, cutting tenons, or on-the-spot trimming of small items. 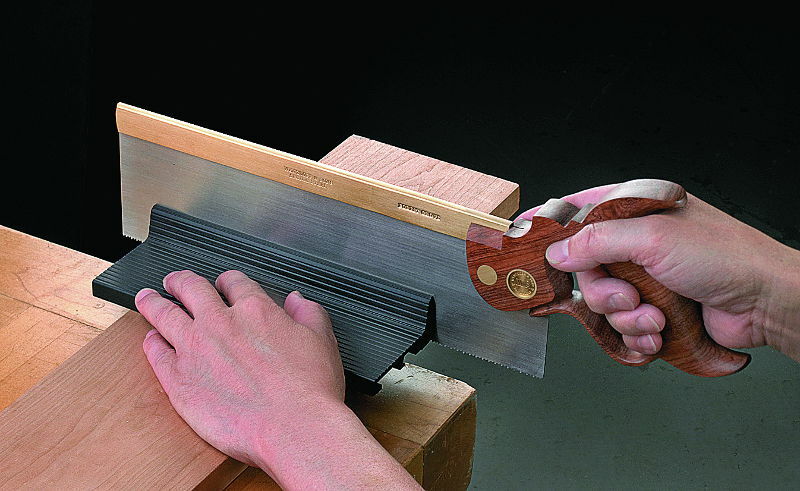 It is also ideal for beginners or children learning to make perfectly square perpendicular cuts on board ends. 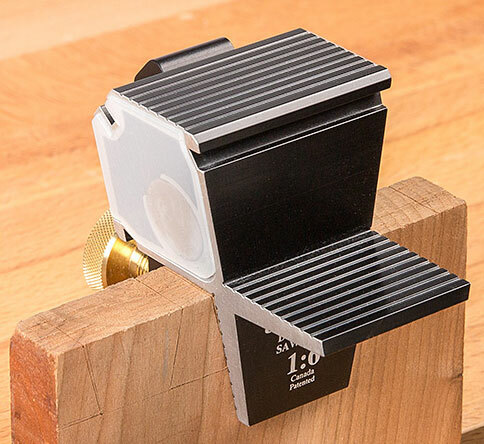 Manufactured using the same precision-machined aluminum extrusion as the dovetail saw guides, each reference surface is embedded with a 19 mm (3/4 inch) rare-earth magnet and covered with a low-friction plastic pad. The magnets keep the saw aligned as you cut; the pads allow the saw to slide easily against the reference surface. 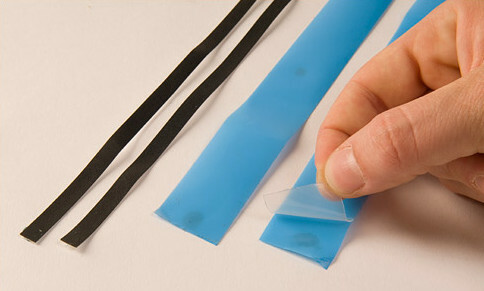 The clamp can accommodate material from 6 mm to 25 mm (1/4 inch to 1 inch) thick. The guide comes with a 8 pages instruction leaflet. for Veritas Saw Guides. You cannot always avoid scratches. Price for a Pair! These anodized aluminum guides help keep a saw square to a workpiece. They are particularly useful when crosscutting tenon shoulders or defining the edges of a dado, since the guide helps a backsaw track straight and true. Held against a workpiece with a hand or secured with clamps (not included), it provides a registration surface, about 1-1/4 inch (32 mm) tall, to help maintain accuracy throughout the cut. The machined reference face has three embedded 1/2 inch (12.7 mm) dia. 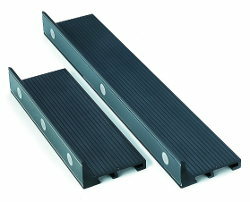 rare-earth magnets and is covered with a low-friction UHMW pad. 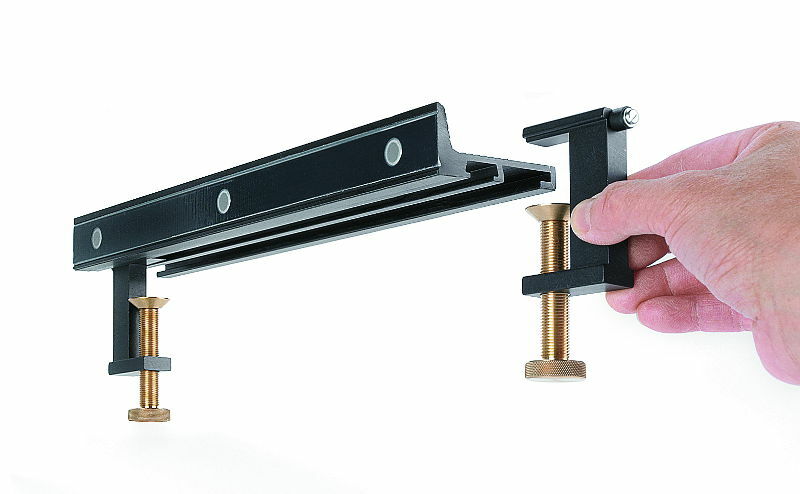 The magnets help maintain tool contact with the guide while the pad allows tools to glide along the reference ace. The bottom of the guide has two high-friction strips to resist slipping on a surface. It also has a T-slot to accept a pair of 2 inch (51 mm) capacity clamps (available separately). 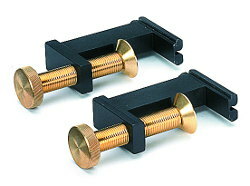 These clamps make the guide easy to secure with accuracy, particularly if you have the use of only one hand.